The Central High School District once again hosted its One Voice, One Message 5K Run/Walk on April 13. The event is in its fifth year and is organized by the district’s student ambassadors, Dr. Joseph Netto, the school psychologist at the Meadowbrook Alternative Program, and Robyn Einbinder, a social studies chairperson at Mepham High School. 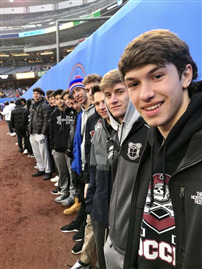 “Many members of the One Voice, One Message committee displayed tremendous teamwork as they worked together over the course of many weeks to plan the 5K Run/Walk,” said Einbinder. “The student ambassadors also helped to plan and execute the event, lining the route to cheer on the participants, as well as offering route directional and water stations,” added Netto. The event raised more than $10,000 for the St. Jude Children’s Research Hospital. Several local businesses donated goods and services for the event including food, water and other goodies. Long Island’s KJOY radio station handed out prizes and Legislator Steve Rhoads and Hempstead Town Supervisor Laura Gillen were on hand to present the district with a citation. 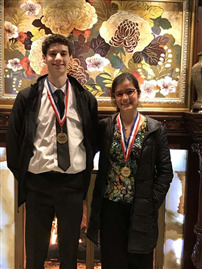 Michelle Serban, an Advanced Science Research student and sophomore at Calhoun High School in the Central High School District, was awarded a Silver Medal at the Al Kalfus Long Island Math Fair finals on April 12 at Hofstra University. Serban was selected as a finalist from hundreds of high school mathematic students across Long Island to present her mathematical research. Her study, “An Exploration of the Correlation Between Consecutive Coefficient Factorable Quadratic Equations and the Fibonacci Sequence,” was well received by fellow competitors and judges alike and we are very proud of her for her amazing accomplishment. Family Project recently enjoyed an engaging and instructional Paint Night event at Merrick Avenue Middle School. Toni Niederhauer was the paint instructor and made this opportunity possible by providing a small canvas, paint and paintbrushes for all of our young artists. The students had the opportunity to paint a purple or yellow flower against a blue background. Niederhauer walked the students through the step-by-step process and student helpers assisted the students with following instructions to complete their projects. Family Project is a club held at Merrick Avenue Middle School from 7:30 to 9 p.m. on Tuesday evenings to foster socialization opportunities for students with disabilities by enjoying recreational activities with their typical peers by crafting, baking, playing in the gym and more. Families are welcome to attend. The Calhoun High School Senior Experience classes have been diligently creating a website and social media pages to keep event-goers connected and updated on their April 16 Fashion Show fundraiser. They contacted local vendors seeking support and donations, as well as organized models and wrote the script for the evening. Senior Experience is a unique class of that combines English and social studies class with an unpaid internship. This allows seniors in the school to experience what the real world is like. Each year, Senior Experience puts on a fashion show that hundreds of people attend and raises more than $10,000 to raise money for a charity of their choice. This year, they received a special pitch from two students who were Make-A-Wish recipients themselves; Jackie Arias and Julia Lincoln. The April 16 event begins at 7 p.m. and tickets are $10 per person. Visit https://seniorexfashionsho1.wixsite.com/srxfs2019 for more information. 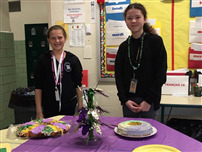 The Department of World Languages celebrated National Foreign Language Week with different activities throughout the district that emphasized the importance of learning other languages. Merrick Avenue Middle School celebrated Foreign Language week with cultural lessons about the holidays Carnevale, Carnaval and Mardi Gras. Students enjoyed crafts, activities and food. Students conducted the daily announcements in a variety of languages and decorated the halls with cultural artwork. Students, faculty and staff participated in the poster contest vote. Mepham hosted its annual Serata Italiana on March 7. In addition to great food and desserts, there were student performances, poetry, and raffles. The World Language Honor Societies decorated the second floor with posters and cultural information. In addition, students participated in a Mystery WL Message contest in which they had the opportunity to win a prize for correctly guessing which faculty member delivered the message of the day. Bm Broadcasting included in the video announcements a special segment in Spanish to commemorate the week. At Kennedy High School students, faculty and staff participated in its annual poster contest. Students in all World Language classes participated in an online quiz that focused on famous foreign celebrities. Students answered questions by following clues that were posted on the department’s Instagram page. 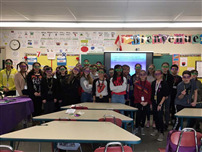 At Grand Avenue Middle School, the entire school community was involved in a series of annual Foreign Language Week activities. The morning announcements featured music from different countries and involved students in a “culture edition” of the building’s Super Sleuth competition. Everyone was also invited to pin their favorite travel destinations on a world map to show how GAMS has traveled the world. At Calhoun, students, faculty, and staff participated in the annual World Languages poster contest vote. Teachers in both buildings focused their instruction on activities that highlighted Chinese, French, Italian, and Spanish culture. The department also held its district-wide contest in which students competed in different categories. We are especially proud of the students’ work as students developed an artistic vision of this year’s theme, “Languages Inspire Unity.” New this year was the photo category in which students submitted original photos showcasing cultural influences of their language of study in their communities. They department would like to thank the entire World Languages department for judging and to the faculty, staff, and students who submitted votes for the poster contest. They would like to send a special thanks to all students who participated and the teachers who helped make this event a huge success. Félicitacions! Congratulazioni! ¡Felicitaciones! 恭喜 Gōng Xǐ! Three members of the Calhoun High School DECA team participated in a successful State Career Conference on March 15, earning them the opportunity to compete at International Career Development Conference in Florida at the end of April. Sarah Encarnacion, Samantha Fortmeyer and Julia Oladipo also earned Top 10 Overall and Top 5 at the conference and are now one of only four teams from New York State chosen to compete at the national level. Their presentation was on a project involving The Red Door Salon & Spa in Bellmore. “Our assignment was based on the local business in the service industry and we all agreed that The Red Door Spa is very familiar to the area,” Encarnacion explained. In order to create a cause marketing campaign at The Red Door Salon & Spa, the students conducted both primary and secondary research. “We interviewed the owner of The Red Door Salon & Spa, who helped us develop a survey that we distributed to existing customers,” added Fortmeyer. Each year the competition involves a different end goal, explained Oladipo, a three-time international competitor. “We developed the RED plan, which raises money and works with the American Breast Cancer Association to produce products for women with breast cancer, as well as raise awareness,” she added. 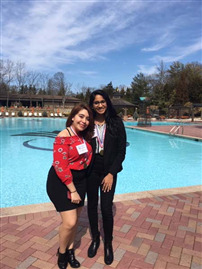 Sonia Sarju, a junior in the Calhoun High School Advanced Science Research program, earned second place at the 2019 South Asian American Women's Alliance Science Fair on March 31. Sarju will also be part of a presentation ceremony on May 19. Kacie McKeever, a sophomore at Calhoun High School, was awarded third prize for Documentary Film in the Gilder Lehrman Institute’s annual Civil War Essay Contest. The course is affiliated with the Gilder Lehrman Institute of American History and is a project-centered research elective in American history. “This year’s competition was especially close, and our staff was impressed with Kacie’s work,” read the recognition letter. McKeever’s submission was selected out of more than 900 entries. The month-long project was researched entirely online and utilized video editing software. The topic of surgical methods during the Civil War was a personal choice of McKeever’s, as she is drawn to learning about medical history. Her social studies teacher, Donald Campbell, advised McKeever and other students on the project. McKeever, Campbell and two members of her family are invited to the annual Lincoln Prize Dinner on April 16 at the Union League Club in New York City. They will also receive a copy of this year’s award-winning book, “Frederick Douglass: Prophet of Freedom,” signed by the author. Members of the North Bellmore Teachers Association presented $2,000 worth of Stop & Shop gift cards to the Central High School District’s Community Cupboard on March 20. The Central High School District partnered with the Society for the Prevention of Teen Suicide to host a Nassau County Youth Wellness Summit at the Brookside building on March 19. The Youth Wellness Summit was a day-long event included students from the BMCHSD, as well as other Nassau County public and private high schools. “The collaboration of over 25 Nassau County schools, the partnership with SPTS and the lineup of speakers, presenters, panelists and workshops was truly awe-inspiring,” said Michael Harrington, assistant superintendent for curriculum and instruction and Long Island Wellness Summit Committee member. The summit was designed to provide students, staff and administrators with the resources needed to support overall wellness, including the prevention of teen suicide and other upstream prevention measures. It began with a powerful and interactive panel discussion presenting young people with inspiring stories of resiliency and hope, including a Mepham alumna, Stacy Brief who was integral in bringing the summit to Long Island. “With mental health issues in America on the rise, the district is seeking positive and proactive ways to engage students in being part of the solution to what is becoming an epidemic amongst adolescents,” said Eric Arlin, director of special education and pupil personnel services. Throughout the day, effective prevention and wellness techniques were presented on a variety of topics including coping skills, yoga, preparing for life after high school, removing toxic friendships, building self-confidence and effective communication skills. SPTS has offered the Youth Wellness Summit in New Jersey since 2014, however, this is the first of its kind on Long Island. “Our hope is that students and staff take the lessons and skills they learned today and become ambassadors in their own districts,” added Harrington. 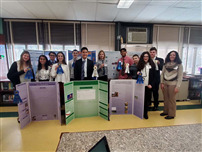 Several students from the Central High School District attended the second round of the Long Island Science and Engineering Fair, as well as the fair’s Junior Varsity portion on March 14. 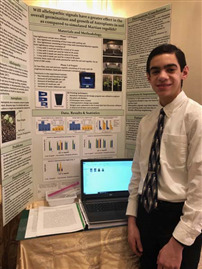 Mepham High School ninth-grader Timothy Langone came in first place in the category of Plant Sciences at the Fair’s Junior Varsity portion. “His results indicated that allelopathic chemicals had a greater impact on plants grown in soil,” explained AP Biology/Science Research teacher Dr. David Kommor. After presenting in LISEF’s first round on Feb. 6, Calhoun senior Matthew Condenzio received honorable mention in the category of Animal Science for his study, “Post Restoration Analysis of Hatches Harbor Estuary, Provincetown, MA,” during the second round. Advanced Science Research teachers, Jennifer Pefanis and Christine Boyce, advise Ventura Subirachs, Sarju and Condenzio. Rakhimov is advised by Advanced Science Research teacher, Barbi Frank. 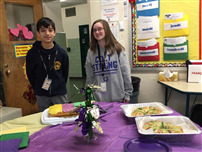 Grand Avenue Middle School Science Research class, under the director of faculty adviser Tami Cruz, dominated the Long Island Science and Engineering Middle School Fair on March 14. All of the 11 students placed and are the following: Tyler Bissoondial, Jessica Blumberg, Mackenzie Filosa, Cameron Franceschina, Adhith Jacob, Massimo Marino, Dillon Moi, Sahara Partap, Christopher Sanchez, Hayden Schneider and Gabriella Simal. Bissoondial, Blumberg, Filosa, Jacob, Marino, Moi, Partap and Simal took home first place in their categories have been nominated to attend nationals in Washington, D.C. next fall. They will first have to go through an application process. LISEF is the regional science fair for students to present their research which qualifies them to complete in the national Broadcom MASTERS, which is administered by the Society for Science and the Public. 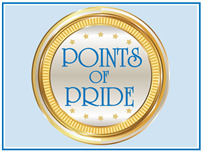 The students now have their sights set on their next competition, the Long Island Science Congress, on April 9. The varsity kickline team at Mepham High School was awarded last month its 15th Long Island Championship title in Pom since 2003. This is the 10th time in the last 11 years that the Pirettes have earned this honor. Additionally, the team earned first- and second-place honors in the Jazz and Team Performance categories through the local competition season. They concluded their season by traveling to New Jersey for the Pascack Valley Invitational, where they received first place. The Calhoun High School Math Team had another great season this year, finishing ninth out of a total of 128 teams. The team also earned a perfect score in the last competition of the season. This year’s team was led by Justin Guo, Tom Giannuzzi, Julia Oladipo, Jasper Seabold and Michael Piacquadio. During the year, these talented group of individuals worked extremely hard solving complicated math problems in both individual and team events. Sophomore Justin Guo, who finished tied for fifth place in all of Nassau County earned a spot on the Nassau County Interscholastic Mathematics League All-Star Team. He will be traveling to Middletown to compete in the New York State Mathematics League (NYSML) in April and the American Regions Mathematics League (ARML) at Penn State University in June. The team, coached by George Lessig, welcomes all students to test their individual mathematical ability, and allows them to engage in team competitions. Michelle Serban, an Advanced Science Research student at Calhoun High School in the Bellmore-Merrick Central High School District presented her mathematics research at the Al Kalfus Long Island Math Fair at Hofstra University on March 1 and was chosen as a finalist to return on April 12. “Michelle was inspired to begin her research through the "Institute of Creative Problem Solving For Gifted Students" at SUNY Old Westbury, in which she takes classes and workshops on Saturdays,” explained her adviser Christine Boyce. With Serban’s project, "An Exploration of the Correlation Between Consecutive Coefficient Factorable Quadratic Equations and the Fibonacci Sequence," she seeks to prove that by using consecutive terms from the Fibonacci and Lucas number sequences, factorable quadratic equations that contain coefficients whose absolute values give consecutive numbers can be produced. “We wish Michelle the best of luck as she prepares for the Long Island finals against the top high school mathematical minds on Long Island,” added Boyce. 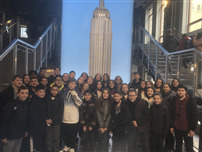 The Yorker Club had their annual Empire State Building trip on Friday. Advisors Mr. Rummenie and Mr. Bargiel chaperoned this historic day while Mother Nature cooperated with epic views of the city skyline including the Statue of Liberty, Chrysler and Flat Iron Buildings to name a few. Last week in social studies, Bridget Gumersell’s eighth grade U.S. History Students used the PA system to broadcast Fireside Chats into their classroom. Each group prepared a short chat that they read from the library as their peers gathered around an image of a fireplace back in the classroom. To make the listening experience more reflective of the era, students also scripted and performed radio advertisements based on products and cultural elements of the late 1930s. “It was a great way to help students develop their public speaking skills,” Gumersell added. Once again, it’s that time of year when students in the Central High School District have been busy preparing for their upcoming musicals. The entertaining season kicks off on March 14-15, at 7 p.m., with “Fiddler on the Roof, Jr.” at Grand Avenue Middle School and “Shrek, Jr.” at Merrick Avenue Middle School. Up next is Calhoun High School On Tour Company’s production of the smash hit “Mamma Mia!” featuring the music of Abba on March 16, 22-23 at 7:30 p.m.
Mepham High School’s Skull and Bones Drama Club continues the fun with the recent Disney sensation, “Freaky Friday” based on original the iconic movie. Performances are March 21-23 at 7 p.m.
Kennedy High School rounds out the season with the hilarious musical comedy, “The 25th Annual Putnam County Spelling Bee.” Performances are March 29-30 at 7 p.m. and March 30 at 2 p.m.
Tickets can be purchased at the door on the night of each performance for all productions. Five projects from Mepham High School’s Intro to Research classes received honorable mention in the Toshiba ExploraVision Competition. Calhoun senior Jessica Lin is among 150 high school seniors named finalists in the 2019 Coca-Cola Scholars Program. Lin, who won a $20,000 scholarship, mentioned her involvement in community-based organizations as her incentive to apply for the academic award. This is an achievement-based scholarship in which more than 95,000 students applied. Lin is being flown to Atlanta, Georgia in April to receive her award and scholarship. 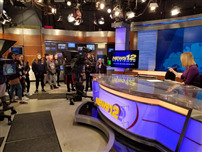 “I’m sorry we’re going live, we need to ask you to leave,” is not the way most field trips are supposed to start, but for the students in Bellmore-Merrick broadcasting program, it was the start of an amazing experience at News 12 in Syosset on Feb. 27. In the world of breaking news, plans constantly change and that is exactly what happened when the students, who are enrolled in the districtwide program that is housed at Wellington C. Mepham High School, arrived for their previously scheduled tour. News 12 made the decision to go live as the Michael Cohen hearings got underway. As the students were being escorted to the studio, they were greeted by a flurry of activity as anchor Tara Joyce ran by the class on her way into the studio. The broadcasting students got a firsthand look at what goes into making live television happen as it was happening. After the initial excitement, Joyce, a veteran reporter and anchor with 10 years of on-camera experience, graciously invited the students back into the studio and talked to them about careers in broadcasting and her career path. “I think the students also got a master class in the multitasking that broadcasting requires,” said teacher Stu Stein as Joyce answered the students’ questions, monitored and took notes on the hearings going on in Washington, D.C., responded to tweets and talked to the director in the control room. As the tour continued, the students got a look inside the News 12 graphics department with artist Charles Bucci. 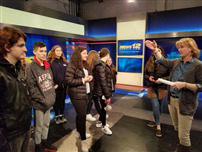 They also learned some tips on reporting from Shari Einhorn, and Robin Demasi guided them through the business of television news and opportunities that could be open to them in the future.